"Picture Scroll Depicting a Poetry Contest on Thirty-two Professions"
"(uta:) Inmidst of the spring flowers - who should be disturbed by the blowing? It is not the wind but the shakuhachi of the komo. (kotobagaki:) The samādhi of the komo-sō consists of putting a paper-cape around his shoulder, hanging a rice bowl at his hip going in front of the doors of the rich and the poor and playing the shakuhachi - they are of no other use." c. 1494. Trsl. by Max Deeg, 2007. "Amidst spring flowers who should care that the wind blows? It is not the wind but the shakuhachi of the komo." 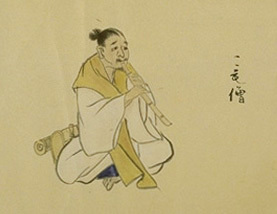 begging and playing shakuhachi - that is all they can do." 1494. Trsl. in Blasdel/Kamisangō, 1988. Date of original: 1494. 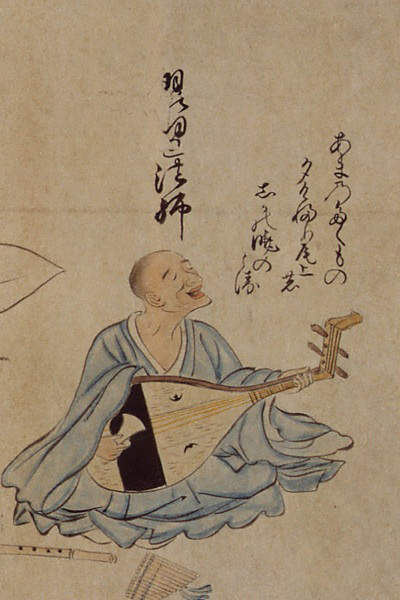 Kōsetsu-bon version. Suntory Museum of Art, Tokyo. everybody wants to evade him. The Komosō is clad in paper meditation garments and a food bucket is tied to his loin. 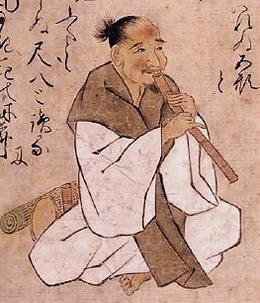 I doubt him to be a person who, besides approaching the gates of high and low, blowing the shakuhachi, has any other profession." 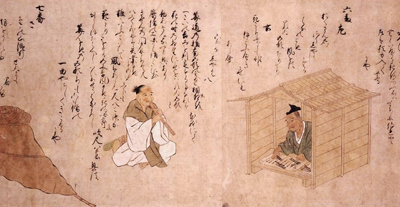 Quoted from the 'Sanjūni-ban shokunin uta-awase emaki', 1494. Trsl. by Torsten Olafsson, 1987. Source: Gunsho Ruijū, Vol. 28, 1933.
the only alms he gets is - tea.'" Trsl. by Torsten Olafsson, 2011. Source: Yamaguchi Masayoshi, 2005, p. 119.